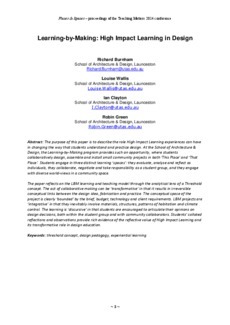 The purpose of this paper is to describe the role High Impact Learning experiences can have in changing the way that students understand and practice design. At the School of Architecture & Design, the Learning-by-Making program provides such an opportunity, where students collaboratively design, assemble and install small community projects in both ‘This Place’ and ‘That Place’. Students engage in three distinct learning ‘spaces’: they evaluate, analyse and reflect as individuals, they collaborate, negotiate and take responsibility as a student group, and they engage with diverse world-views in a community space.